GoPro's Lexar High-Performance microSDHC UHS-I card is a premium mobile memory solution for your action camera. The Class 10 microSDHC UHS-I card and USB 3.0 reader give you the power to quickly and easily capture, play back, and transfer large, high-quality video files with read speeds up to 90MB/s (600x). 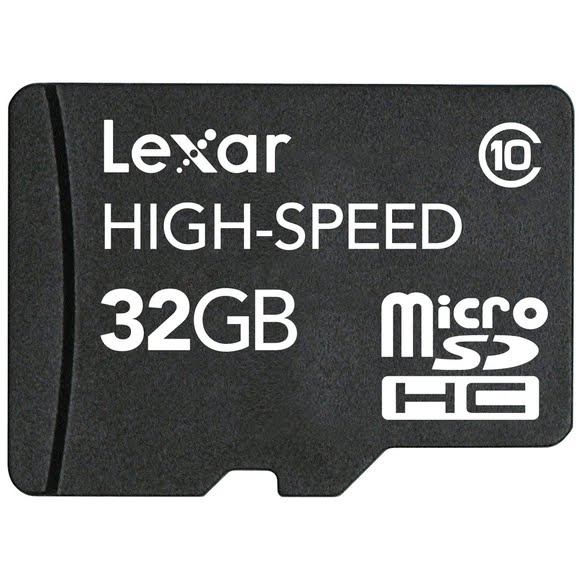 The Lexar High-Performance microSDHC UHS-I card is available in 32GB capacity. GoPro&apos;s Lexar High-Performance microSDHC UHS-I card is a premium mobile memory solution for your action camera. The Class 10 microSDHC UHS-I card and USB 3.0 reader give you the power to quickly and easily capture, play back, and transfer large, high-quality video files with read speeds up to 90MB/s (600x). The Lexar High-Performance microSDHC UHS-I card is available in 32GB capacity.Ready to store and transfer lots of video? The Lexar High-Performance microSDHC UHS-I card makes it easy to quickly capture, play back, and transfer all your favorite 1080p full-HD, 3D, and 4K videos. The card is speed rated at Class 10, and leverages UHS-I technology to deliver a read transfer speed up to 90MB/s (600x). What&apos;s more, the card comes with a USB 3.0 reader for high-speed file transfer-up to 8x faster than transferring directly from a cabled action camera.